RevuCell Organics’ natural hair therapy system is made with organic ingredients to help diminishes the appearance of hair loss while promoting healthy hair growth. 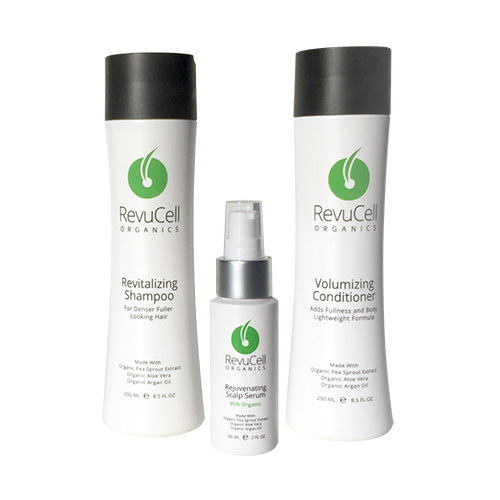 RevuCell Rejuvenating Scalp Serum promotes healthy hair growth and strengthens damaged hair. Rich in phyto-nutrient Pea Sprout Extract and Antioxidant Polyphenol rich Aloe Vera, RevuCell Hair Loss Serum promotes a healthy scalp environment while inducing the dermal papilla to reactivate hair growth. Our unique blend of ingredients helps to rebalance the hair growth life cycle while conditioning existing hair and protecting it from breakage and loss. Use in combination with RevuCell Hair Loss Therapy Shampoo and RevuCell Hair Loss Therapy DailConditioner. RevuCell Revitalizing Shampoo gently cleanses the hair and promotes natural hair growth. Rich in phyto-nutrient Pea Sprout Extract and Antioxidant Polyphenol rich Aloe Vera, RevuCell promotes a healthy scalp environment while inducing the dermal papilla to reactivate hair growth. Our unique blend of ingredients helps to rebalance the hair growth life cycle while conditioning existing hair and protecting it from breakage and loss. RevuCell Volumizing Conditioner gives you natural volume and fullness. Daily Conditioner and Detangler for thin and fine hair. Helps to seperate and free the hair for a fuller and more dense look right out of the shower. Just blow dry and style after use. Rich in phyto-nutrient Pea Sprout Extract and Antioxidant Polyphenol rich Aloe Vera, RevuCell promotes a healthy scalp environment while inducing the dermal papilla to reactivate hair growth. Our unique blend of ingredients helps to rebalance the hair growth life cycle while conditioning existing hair and protecting it from breakage and loss.